In the activity report, we present our main activities, projects, services and, in general, the progress of each year. You can also find important statistics from the network. Below you can find the reports from 2011-2016. Youth information services and workers provide assistance to all young people, helping them to make informed decisions that will shape their future. This service is available to every single young person, free of charge, and has a real impact on shaping their future. However, not all young people are aware that these services are available to them. The aim of this project is to rethink how services are designed and to create tools and resources to allow youth workers and youth information workers to reach out to a maximum number of young people, especially those at risk of social exclusion. In order to do this, youth information providers need to be trained on new channels and tools, and on how to design their services in a user-centred and innovative manner to appeal and reach out to more young people. This project will use service design methodologies and desk research. The service design is approached from a human-driven way of design thinking and doing. It starts from the needs and requirements of users and looks for solutions together with providers, users and other stakeholders. To carry out innovative youth information design pilots that will test the resources developed at different stages and help re-think youth information provision using service design methods, which can be used as good practice examples for youth information services across Europe. At the end of the project, regional and national multiplier events will be organised by all of the partner organisations. This will be tailored for political awareness-building at local, national and European level for the further support of youth information services in participating countries, and to highlight the importance of the promotion of these services. The project will begin in March 2019 so stay tuned! In April 2018, the General Assembly of ERYICA approved in Cascais a new European Youth Information Charter and ERYICA Strategic Plan for 2018-2023. Both documents highlight the challenges faced by young people when it comes to addressing the overload of information and the need of ensuring the quality and visibility of YIC services. The Strategy goes further and underlines the necessity of creating a European Youth Information Quality Label easy to recognise by young people, based on their needs and on the principles of the European Youth Information Charter. In this context and in the framework of our partnership with the Council of Europe, ERYICA will work on the development of a European Youth Information Quality Label throughout 2019, designed for and with young people and linked to a set of quality assessment criteria, mechanisms and tools. ERYICA believes that such an initiative should be part of a broader development process involving young people and key actors in the European youth sector. A Working Group will be set up to work on the label. Stay tuned to see the European Youth Information Quality Label soon! The project was created due to the lack of evidence-based research in the field of youth information, which blocks the development of the sector. With this in mind, research has been carried out to identify youth information needs, trends, and most relevant topics. The survey was compared and contrasted with an ERYICA survey which was carried out in 2013, and, perhaps most innovatively, used future foresight methodology to identify a strategic direction for youth information, something that has never been done before. Read the results of the report Future Youth Information and Counselling: Building on Information Trends and Needs, as well as the Executive Summary of the Future Foresight activities. The project has also published a Future Foresight Manual: Manual for Foresight in Youth Information. Using the results of the research and the future foresight, three user-friendly, evidence and future-based youth information methods will be developed and piloted at local level. For the sustainability of the project, a peer-to-peer training course will be developed and peer teams will be organised in each country. At the end of the project, a multiplier event will be organised. This will be tailored for political awareness building at local, national and European level for the further support of youth information services in participating countries, particularly those who require it the most. The Developing Online Youth Information Trainings (DOYIT) is a 2 year initiative that will adapt 4 ERYICA training courses (YoMIM, Digital YIntro, Jimmy, Advocacy and Lobbying Training for Youth Organisations) to an online webinar platform, thereby increasing their outreach and decreasing the cost of training for youth information workers. The project aims to familiarise youth information workers, youth workers and trainers with new training and learning methodologies, using an online setting. 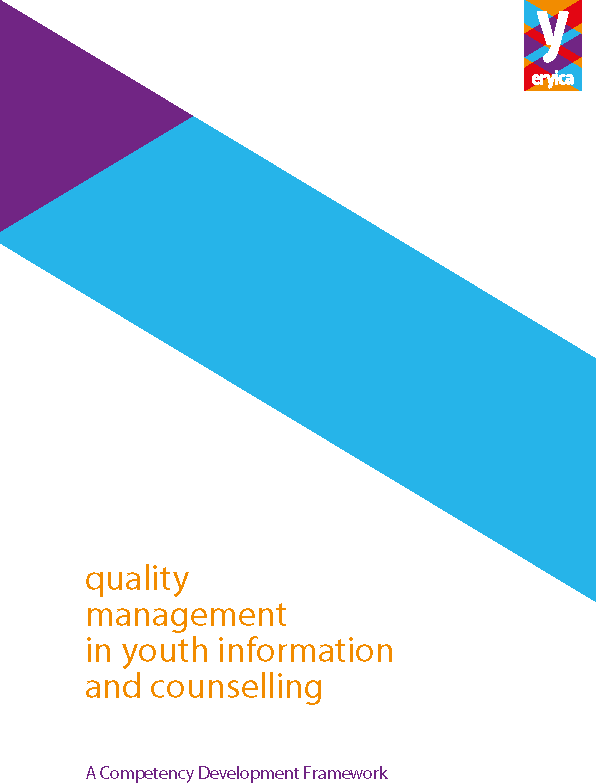 It also aims to define quality assessment tools and evaluation methodology for online courses in the youth work sector, and use the ERYICA Quality Management Catalogue to further increase the quality level of youth information and counselling services. The project is running during the course of the year 2018. You can read the survey report here. The overall objective of the project is to analyse and understand the motives behind violent youth extremism across Europe, and the preventative role that youth information and counselling services can play. The project began back in 2015, when the French-speaking members of ERYICA came together to discuss the role of youth information in the prevention of youth violent extremism. ERYICA organised an Open Dialogue day in June 2016, which brought together experts on this topic from different sectors to discuss and exchange on their varied experiences. The results of these discussions and two years of working together is Liaisons- Manual for the prevention of violent extremism through youth information. The editorial team has gathered and created the most pertinent tools for preparing young people with the resilience and critical thinking skills necessary not to fall into the trap of radical and extreme ideas. The manual is first and foremost a practical tool, targeted at those who come into contact with young people (youth (information) workers, teachers, social workers, youth organisations, etc.) and aims to help them cover complex topics such as identity, diversity, communication with others, media and information literacy, to name but a few. There is also a theoretical component to the manual, which aims to help the reader to understand this complex phenomenon. You may find here the e-version of the Manual in French and English. Partners: University of Luxembourg (Luxembourg), ERYICA, Universitat Hildesheim (Germany), Deutsches Jugendinstitut Academia (Germany), De Studii Economice Din Bucuresti (Romania), University of Miskolc (Hungary), Hogskulen i Sogn og Fjordane (Norway), Ilustre Colegio Nacional de Doctores y Licenciados en Ciencas Politicas y Sociologia (Spain), European Research and Project Office (Germany). The overall ambition of MOVE is to provide a research-informed contribution towards an improvement of the conditions of the mobility of young people in Europe and a reduction of the negative impacts of mobility through the identification of ways of good practice thus fostering sustainable development and well-being. The consortium of MOVE is built up of nine partners within six countries: Luxembourg, Germany, Hungary, Norway, Romania and Spain.The main research question is: How can the mobility of young people be ‘good’ both for socio-economic development and for individual development of young people, and what are the factors that foster/hinder such beneficial mobility? Based on an interdisciplinary and multilevel research approach the main objectives of MOVE are to:  carry out a comprehensive analysis of the phenomenon of mobility of young people in the EU;  generate systematic data about young people’s mobility patterns in Europe based on qualitative case studies, a mobility survey and on secondary data analysis;  provide a quantitative integrated database on European youth mobility;  offer a data based theoretical framework in which mobility can be reflected, thus contributing to the scientific and political debates. explore factors that foster and factors that hinder good practice based on an integrative approach with qualitative and quantitative evidence. provide evidence-based knowledge and recommendations for policy makers through the development of good-practice models. MOVE is based on a multilevel research design, including case studies on six types of mobility (higher education, voluntary work, employment, vocational training, pupil's exchange and entrepreneurship), a survey (N=6400) and secondary data analysis, taking into consideration social inequality (e.g. migration background, gender, educational inequalities, impairments). The focus will be on the regional contexts of mobility and the agency of young people. The project will end in March 2018 with a pre- and final conference. The Final Report of the MOVE Pre-conference is available HERE. The solution is created within the EUth project: OPIN, an all-in-one proven digital and mobile participation toolbox, ready to be embedded in web presence of youth organisations or administrations. The project started in 2015 and will end in March 2018. It has involved 11 partner from 8 countries, 5 pilot projects and 10 Open Call projects, all of whom have tried and tested the OPIN software. The project will end with the Open Summit in Berlin on 7-8 December 2017. The project “EUth - Tools and Tips for Mobile and Digital Youth Participation in and across Europe” has received funding from the European Union’s Horizon 2020 research and innovation programme under grant agreement No 649594. Programme: European Youth Card Association (EYCA Belgium), ERYICA (Luxembourg), Eurodesk (Belgium), Youth Act Center (Albania), LOGO jugendmanagement gmbh (Austria), De Ambrassade (Belgium), National Youth Card Association (Bulgaria), Koordinaatti (Finland), Youth Work Ireland (Ireland), LABDAROS IR PARAMOS FONDAS "JAUNIEMS" (Lithuania), AGENZIJA ZGHAZAGH (Malta), INSTITUTO PORTUGUES DO DESPORTO E JUVENTUDE I.P.D.J (Portugal), IUVIA NGO (Serbia), Vale of Glamorgan Council (UK), The Council for Wales of Voluntary Youth Services (UK). The project brought together youth (information) workers, communication strategists within member organisations, experts in PR & Communication, youth representatives, and representatives of the three European platforms to create synergies and to be trained on how to increase the reach of their services towards young people through innovative PR, communication and youth marketing methods used in other sectors. 3. Develop an online publication comprising the most significant challenges of the sector, methods to better promote their services & good practices. The good practice booklet can be found on our tools and resources page. The Guide for best practices in Youth information work is a valuable resource for youth information workers containing methods and best practices of youth information work in Europe, and it is a product of the Strategic partnership project “Youth Information Workers fit for Youth” (2016-2-MK01-KA205-021756) between SEGA, UMKI and ERYICA. It contains methods for on-line information and best practices of youth information work in Europe. The project “Youth Information Workers fit for youth” is supported by the National Agency for European Educational Programmes and Mobility in Macedonia, through the Erasmus + Programme, Key Action 2 - Strategic Partnership - Support for Exchange of Good Practices. The purpose of this Guide is to provide youth information workers with knowledge and resources on youth information methods and techniques. Moreover, the guide will present different experiences and practices of the youth information centres in Europe. Partners: ERYICA (Luxembourg), Council of Europe (France), Ministry of Youth, Municipality of Tbilisi – Youth Department (Georgia), Creative Development Centre (Georgia). Other participants were from Georgia, Azerbaijan, Armenia, Turkey, Moldova, Ukraine, Albania, Bosnia and Herzegovina, F.Y.R. Macedonia, Bulgaria. This seminar represented a strong opportunity to develop youth information in the Eastern Europe and Caucasus (EECA) region and boost the enhancement of youth policy in the target countries, by gathering selected participants and enabling them to discuss and share issues, solutions, projects and best practices with each other and with European stakeholders. With this seminar, the Council of Europe and ERYICA wanted to enforce their role by facilitating the strengthening of contacts with youth information stakeholders in Eastern Europe and Caucasus with the aim of enabling them to become part of the countries that provide youth information and counselling services, by levying on the possibility of networking and become acquainted with standard ways of youth information in Europe and in partner countries. Partners: 120 youth information workers and young people from 9 African and 10 European countries (Angola, Burundi, Guinea-Bissau, Kenya, Malawi, Sao Tome and Principle, Tanzania, Uganda, Zambia, Austria, Belgium, Finland, Ireland, Lithuania, Luxembourg, Malta, Norway, Portugal, the Netherlands). From 9 African countries (Angola, Burundi, Guinea-Bissau, Kenya, Malawi, Sao Tome and Principe, Tanzania, Uganda, Zambia) and 10 European countries (Austria, Belgium, Finland, Ireland, Lithuania, Luxembourg, Malta, Norway, Portugal, The Netherlands), 25 core partners came together to build a meeting point among young people and youth information workers from Africa and Europe. With the collaboration of the Portuguese Institute for Youth and Sports (IPDJ) and the Portuguese Youth Council (CNJ), ERYICA coordinated the preparation of the Summer University that involved not only the 25 core partners but also other ERYICA members, youth information organisations and networks, such as the European Youth Card Association (EYCA) and Eurodesk. Through the Summer University, ERYICA and the partners aimed to support the development of youth policy in Europe and in partners’ countries by leveraging on quality youth information and counselling. Furthermore, we gathered data and evidence on the situation of YIC in partners’ countries and to include it in the final report, for dissemination and understanding among the SUYIC participants and among other partners and stakeholders. • Improve the capacity of youth workers and organizations to increase young people’s employability, health, mobility and reduce youth poverty on a global scale. The Summer University consisted of a number of non-formal education activities, expert presentations on youth information, group work on regional perspectives, training modules, networking activities and feedback sessions. All these activities will have in sight the drafting of development plans and partnerships, making the event the first step of a comprehensive development process among partner. The participants will have the chance to gain experience of African and European projects, to discover common links and common interests, making the Summer University a push to move forward and bring forth the European model in information to a global perspective, by learning from others’ practice. The Summer University on Youth Information and Counselling 2014 was implemented with support from the Council of Europe, and from the Youth in Action Programme of the European Union. The overarching goal of the Youth on the Move – InfoMobility (YoMIM) project is to innovate and to enhance youth work whilst fostering synergies between and maximisation of impact of the main actors in the field of youth information and counselling, paying special regard to cross-border European mobility. By pursuing innovation, streamlining, optimisation and enhancement, this project aims at offering new methodological and technological solutions to the new challenges of youth work, with regard to its content. Through diverse channels, the elements of novelty and innovation that will be raised will be shared with and presented to many actors and decision makers, so that the field non-formal education as a whole will be benefitted a great deal. Design and provision of training for the YoMIM officers and enhancement of the existing training offer. In sum, the YoMIM project is at once about innovating, enhancing, streamlining, optimising and spreading new tools and methods. Information Right Now! was a European campaign, launched on 17th April 2012 and implemented by the European Youth Information and Counselling Agency - ERYICA in partnership with the Council of Europe. The campaign aimed to raise awareness among young people, decision-makers and media on the special role of youth information with regard to young people’s access to rights and – eventually – on the access to information as a right in itself for all young people. Respect for democracy, human rights and fundamental freedoms implies the right of all young people to have access to complete, objective, understandable and reliable information on all their questions and needs. This right to information has been recognised in the Universal Declaration of Human Rights, in the Convention on the Rights of the Child, in the European Convention for the Protection of Human Rights and Fundamental Freedoms, and in the Recommendations N° (90) 7 and CM/Rec(2010)8 on Youth Information, as well as by the European Commission White Paper on Youth (2001). Young people to understand they have the right to information. Young people to understand they have a right to information and move them to find it in the Youth Information Centre. Together with young people, ask decision makers to guarantee their right to information. On a decentralised level, the campaign consisted of numerous activities of different scope and scale in all Council of Europe member countries, organised by local Youth Information Centres and Youth Workers, and tailored to the respective target audiences. The activities listed above as well as the Facebook page, the photo competition and the website were coordinated centrally by ERYICA. Youth Ambassadors acted as European-wide testimonials of the campaign. The 9th Conference of Ministers of the Council of Europe was a prominent occasion to present the activities from the pan-European action day through a travelling photo exhibition along with other campaign events. Living together in diverse societies. Considering that youth information is both an essential right and a prerequisite for young people's access to their rights, in view of contributing to the success of the Conference of Ministers and the previous process leading to it, the Joint Coordinating Committee managing the partnership between the Council of Europe and ERYICA decided to support the "Information Right Now!" campaign on the young people's right to information. Find more information, see the documents below, and please visit www.informationrightnow.eu. The main aim of the project was to establish long term cooperation between youth workers and youth information work, thus increasing the outreach of youth information to young people (with special regard to those with fewer opportunities) and the professionalism of youth workers. The information needs of young people were examined through focus groups in 7 countries, with the participation of over 250 young people and the findings were incorporated in the training courses. - a leaflet presenting the main results of the focus group survey. The developed training courses are part of the ERYICA training system and are being organised around Europe. The project partnership included youth information professionals of the ERYICA network from Austria, Finland, Italy, Luxembourg, the Netherlands, Slovenia, Spain and the United Kingdom. Over a project period of 18 months the Training Task Force and the partnership of the project developed the above mentioned courses and trained further 16 trainers from 12 countries to disseminate the content of those. By their activity, the outcomes of the project are spread further through a sustainable dissemination strategy. Jimmies work in cooperation with Youth Information Centres and increase their outreach, providing information services to young people. Flyers on the Jimmy concept and the results of the focus groups have been published and disseminated throughout ERYICA’s strong network of 33 members in 28 European countries, providing them with hands-on information on the given topics that they can disseminate in their national structures around Europe. Safety and Quality in Online Youth Information (SQOYI) is an ERYICA project that we worked on together with a number of experts from our network. The project seeked to create and disseminate knowledge for Youth Information workers to empower young people to make good use of available online Youth Information resources. An Info-KIT providing guidance to young people on how to find information on the Internet and on how to generate good content. The material also includes good practice and examples featuring innovative techniques. Quality principles for participative and user-generated online Youth Information were established and then promoted as an integral part of the “European Youth Information Charter”. The created material was directly used for a training of 30 trainers of Youth Information workers and two international workshops involving 50 young people, empowering them to enact efficient searching strategies also in user generated content environments besides a safe and proper use of internet. The project ran until April 2011 and took place in different European venues.